Jakarta, Indonesia 02 April 2015 – Panasonic today officially opens Panasonic Business Showroom Jakarta at Cawang. The 230m2 showroom, located within the premise of Panasonic Gobel Indonesia, comprises of five experiential zones - Security Solution, Office Solution, Shop Solution, Energy Solution, and Air Conditioning System Solution. The facility is the first showcase of the company’s full suite of business-to-business (B2B) solutions available in Indonesia. The Panasonic Business Showroom enables customers, business partners, employees and sales representatives as well as vendors to experience each solution first-hand. Showroom visitors will also be able to view the company’s key Corporate Social Responsibility initiatives such as the provision of LED lighting at Prambanan Temple, a UNESCO World Heritage Site; and the stand-alone Power Supply Container in Karimunjawa Island, aimed at alleviating poverty in remote areas through the electricity. “Indonesia is one of Panasonic’s key strategic markets in Asia Pacific. For 55 years, we have been contributing high quality and long-lasting products to the Indonesian society in order to create a better life and a better world. By establishing our Panasonic Business Showroom, we will be able to demonstrate our business-to-business capabilities to our customers and partners more effectively. Panasonic aims to become a one-stop Business Solution Company that can meet the dynamic needs of today’s ever-changing business landscape,” said Hiroyoshi Suga, President Director of Panasonic Gobel Indonesia. Committed to strengthen the B2B portfolio in the country, Panasonic Group in Indonesia targets to double the number of employees working on business projects and partnerships in fiscal year 2015. 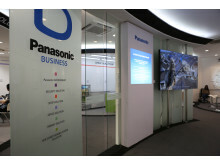 “With the opening of this Panasonic Business Showroom, we aim to enhance market visualization. Last year, we organized the Panasonic Solution Forum to showcase our innovative technologies and solutions. Today’s B2B showroom opening brings us a step further by having our products and solutions available under one roof. In the B2B sphere, Panasonic hopes to work with our local business partners as an integrated solutions provider, particularly in the Developer, Government, Commercial, Hospitality, and Retail sectors,” added Heru Santoso, Associate Director of Panasonic Gobel Indonesia. This smart city, which is located 50 km from Tokyo, has been on a transformation into an energy saving city by Panasonic since 2007. With an area of 19 ha, this city will be inhabited by 3,000 people and 1,000 houses with comprehensive facilities, including health and education facilities. The concept is to bring energy into life, which means providing electricity as the main source of daily life. Combining environmentally friendly concept, convenience, and security, Fujisawa Town aims to decrease CO2 consumption up to 70% and water use up to 30%, with dependence rate to renewable energy up to 30%. With no energy and water supply from outside, this city could survive for 3 days with its own energy, stored inside an eco friendly battery with a solar panel system. Panasonic, a leading company of video surveillance cameras and solutions also showed the Face Recognition which provides face matching, face searching, people counting and age and gender statistics capabilities for video surveillance systems technology. This fast and cost effective solution is ideal for retail stores, campus security, airports, transit/public safety and enterprise applications. Aside to facial recognition technology, also showed 360-degree camera combine with innovative 360-degree audios monitoring which provide next-generation audio and video surveillance, featuring clear pintpoint audio monitoring in any direction. Having this technology is a big step toward making business more secure and productive. The Network Microphone equipped with a 360-degree Network Camera is ideal for businesses such as stores, banks, customer service centres, casinos, etc. Panasonic's HD Visual Communications System reduces initial costs while enabling multi-site connection. Its high image and sound quality is another very appealing point. And it allows people to participate in videoconferences from just about anywhere via mobile devices. The high en29d model has capability to connect multi-site up to 10 locations which bring improvement to HO & Branches communications. This cost effective conferencing solution is ideal for Banking, Healthcare, Offices, Factory. Panasonic Group in Indonesia aims to achieve a 140% business growth in FY2015 compared to FY2014 in two focus areas of B2B business which is system solutions and eco solutions. The company will focus on solidifying its B2B presence while at the same time, maintaining its market lead in the B2C area. Panasonic Corporation will deploy a new brand strategy, including a new brand architecture, in April 2015. Specifically, it will adopt new “Panasonic Business Brands” across five business fields. These business brands will strengthen Panasonic's brand images in the devices sector, in addition to consumer electronics. The company will accelerate growth through “Panasonic Homes & Living”, “Panasonic Automotive”, and “Panasonic Business” brands in the housing, automotive and B2B sectors respectively. Note: please let us know two days ahead of the visiting time should there be any visit request. In Indonesia, Panasonic has long history that closely related to Indonesian people. Started by the introduction of ‘Tjawang’ Radio by the later Drs. H. Thayeb Moh. Gobel in 1954, the first TV in 1962, and the introduction of National brand in 1970. Later in 2004, National brand changed its name to Panasonic. Until now, Panasonic is known as one of the leader in Indonesia’s electronic industry through its innovative range of products, such as TV plasma, camera, AC, fridge, washing machine, etc. For further information about Panasonic’s business in Indonesia, please refer to our website www.panasonic.com/id or our Customer Care Center in +6221-8009494.